With Urban mobile subscriber base close to saturation point, most of the handset manufacturers are aggressively targeting the rural Indian market to increase their subscriber base. However, one of the biggest impediments is that many villages in India still lack proper supply of electricity – And where the supply is available it is quite erratic. Now if you do not have proper supply of electricity, the biggest issue is – How are you going to charge your mobile phone? Worry Not ! 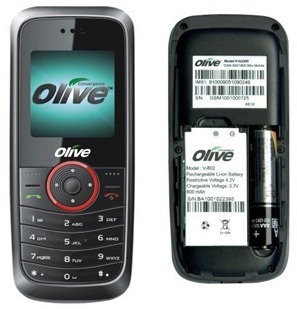 An Indian Telecom company “Olive Telecommunications” has launched a mobile phone that runs on regular “AAA” batteries. The mobile phone aptly called "FrvrOn" — short for "forever on" — has a rechargeable lithium-ion battery common to mobile phones, but also a facility to include a AAA, dry-cell battery. Whats more – this mobile does not cost you a bomb. It comes to you for mere 1699 rupees ! This is probably the first mobile phone in the world (atleast I think so), which has this kind of facility built into the handset. Its not only rural people who will benefit, but also urban heavy mobile users or people travelling to remote areas where they may not get electricity. Just pack couple of batteries and all your worries about mobile battery draining off will be history. Personally, I think this is a great idea and I see other mobile manufacturers following suit very soon. Whats your take? Do you think regular battery based mobile phones will become popular with Indian people? "Now a Mobile Phone that runs on AAA battery ! ", 5 out of 5 based on 1 ratings. where to buy? I live in Taiwan! It is really a wonderful idea and I think most of the leading mobile handset companies should adopt it for their multi-featured expensive handsets. This is what I was thinking for a long time. One could also consider rechargeable AAA batteries. Wonder where this mobile is available? And who is going to come up with a charger buit into the phone that its pins flip out and one can just plug it into any point? (may be most of the multinational companies do not think about including such a pin because of the variations in plug points from country to country – not a problem for an indian company selling phones in india. I think ALCATEL was the firm (Might be GERMAN) who used to see the cell phone with AAA batteries when the mobile phone era started in the country. i mean to say i want a litium battery pack which is not use for recharge purpose but it is for the mobile phone which is been manufactured in japan n china ..but how many days it last i dont know ….pls do send me details if u have the ….. I think if Nokia/Samsung etc organize a competition even with minimal prizes asking ‘What all can you pack in a mobile phone?’, that’d do wonders for innovation in mobile phones. Yes there is a will there is a way. In telecommunication we are continuously growing. Still there is a huge scope of innovations for mobile manufacturers and service providers. Money transfer facility through mobile is still awaited in rural India. ( as we know model is working very successfully in Africa. NIce articles Mr. Prabhudesai. Thanks for let us know about this phone. absolutely Yash – you said it correctly Its “Desi Innovation” in full swing ! !